There’s a myriad of – mostly new – mobile services that try to cater to the needs of the modern professional. Most offer communication services, some contact management features, some help you to share media, many have added all kinds of location-relevant features. But none, except Belysio, offer all of these in one integrated solution that is free of charge and available worldwide. Belysio, conceived by its co-founder in Dusseldorf, Germany and now established as a small company located in Poland, sets out to answer the most vital questions asked by the mobile internet nomad: Where are you? Are you available for me? What are you doing? The global citizen of today uses several email accounts, messenger clients, communities, and social media. Through many of these applications we can, at default, communicate our ‘status’, i.e. where we are and/or what we do. And also: through which of our media we want to communicate at a particular moment of time. These status messages, or “presence” indications, have quickly become a very much appreciated, for many even unmissable, extra layer in our communications. But unless we change our status simultaneously across all these “channels”, one by one, the audience to which we have to “broadcast” has no idea what we are doing. Belysio offers a one stop solution to this problem by logging on to all of these channels on behalf of the user – automatically. With a surprisingly practical interface. Another feature is triggered when friends are nearby and Belysio sends you an alert accompanied by a little sound on your phone. This gives you the option to leverage your physical proximity to meet with friends whom you would normally miss, or catch by shear chance. Now in this way you can make serendipity work for you more often. The nomad is by definition a traveller and has friends in lots of places. That makes it very hard for us to keep track of friends and acquaintances. While it is rather rare that we really run across friends by accident, there is a much higher probability that your friends are in the same (quarter of) town. Belysio shows where our friends are by gathering the location from the mobile phone through various operator independent technologies. This variety is pretty important as most providers of location based services mostly go for one location method only. 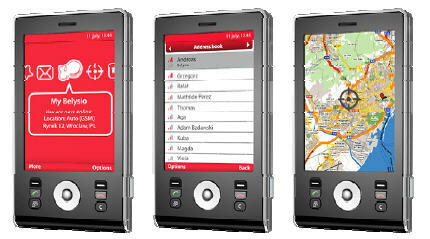 Largely you can group them into GPS (Loopt, GyPSii), Bluetooth (Aka-Aki, Mobiluck) and operator dependant (Qiro). The coverage of GPS is still lousy especially in built up urban areas and when indoors. Operator dependant location is costly and not available worldwide, while Bluetooth is very short range (10 m). Furthermore, with Belysio’s unique People Search feature users can be found by location and tags, if they chose to make their profile and location public. With the passive constant search of Belysio the window of opportunity to meet is widely opened. Belysio makes it easy to make new friends by notifying you when someone comes close by and who also matches your interests. Belysio’s competitors only facilitate active searches. Since the one for which you search very often is not close or even online, this functionality is most often a dissatisfier. Of course some people associate location based services with serious concerns regarding privacy and safety. Belysio has tackled these issues by creating very granular ways to define different levels of privacy status. The location can be turned off at any time. It can be defined manually and it can be restricted to be visible only to the connected network of friends, and it can be opened widely to be visible to the world. So it is up to the user to define for whom he wants to be visible, and for what user generated content they have access to. This brings us to the next really cool feature. To let people know what you are doing or have been doing, Belysio has integrated a Geo Journal feature. Users can upload and share their photos, and tag these with a comment and the location. Every entry in the Geo Journal, like the presence management options, can then be shared with the public, or restrict visibility to (groups of) friends, or even to a single contact. In this way you can not only say, but also show what you are doing, and share that with your friends. The Geo Journal also enables you to discover locations by browsing through entries that other users have left. So now locations get a user generated history. Imagine being new to a city and you search for comments on Japanese restaurants. All entries regarding sushi will be shown within their ascociated Geo Journal entries. Imagine further that you are on your own. If one of the users that recommended a good place for lunch is online and nearby, you can invite him or her to join you spontaneously. Premium members can also plot an entire route on a map and let friends and family follow their journey. This feature in itself is not unique, but the way to upload images, the constant tracking and integration of your location and the way viewing is managed on the entries is unique. Most companies that let their users share images over mobile either require to send an MMS (Socialight, Radar, etc.) to a special number – which is inconvenient and expensive. Others do not offer location tagging at all, or only let you share content with friends (Loopt). Text is text, whether it comes from email, ICQ or SMS. Belysio has developed a well integrated set of mobile communication tools, with a unique architecture. The leading instant messengers (including ICQ, GTalk, Yahoo IM, MSN, AIM, Gadu-Gadu and soon Skype) share one message inbox with Belysio messages.. Additionally, you can aggregate all your email accounts in the same simple application. Regardless of the channel, all messages are stored and viewed in one conversation sorted chronologically per user. For instance, you can easily set up a chat with a friend who uses ICQ on his desktop. When he leaves the PC, you continue the same chat on Belysio or over SMS. Afterwards all conversations can be viewed on the Belysio website as one homogeneous dialog running across multiple channels. Similar services have also been developed by other companies as Nimbuzz, Fring, iSkoot, eBuddy, and many more. What makes Belysio different, is that they really bring channels together. Normally you have to maintain a kind of an inbox for every messenger. Belysio brings Google’s conversations to the next level. Messages are not only grouped by subject. Messages are grouped chronologically per person, regardless of the channel over which the messages have been sent or received. In summary, Belysio makes your phone into an integrated cross-channel communicator. To help you manage all of your contact data sources and social network contacts, a core piece of Belysio’s service is the integrated address book, which allows merging contacts from the mobile phone’s address book, from instant messengers, from email accounts and soon also from social networks and communities. All these contacts are stored on the Belysio website. In practice this means having an address book that contains the community that counts most to you: the mobile phone’s address book, plus all buddies from ICQ or MSN Live, plus all email contacts, as well as soon your personal network in Facebook and/or LinkedIn. Zyb and Plaxo focus solely on this kind of feature on-line, Belysio provides it en passent – to your handset so that you can use it from wherever you are. In other words, now your address book comes alive to truly support social behaviour. To top everything off, Belysio has added a collection of location based services: weather forecasts, news, local info, RSS, direct access to your favourite mobile website and of course the possibility to update Twitter and tweet with a location stamp!. Belysio is helping to simplify the fragmented life of the polygamist membership behaviour social networkers belonging to multiple communities. By letting the mobile client become a personal integration gateway to existing social networks and social location based services is a real break through. It delivers a genuine consumer benefit of convenience in ways that can provide seriously fun entertainment and surprisingly practical applications. As with all social networks, you need friends to make it fun and useful. Therefore I encourage everyone to immediately upload contacts, to enter all IM and email accounts and to invite as many friends as possible. Even with a small group of friends and/or family members you can definitely enjoy Belysio a lot. And if for some reason your phone is not yet supported, it will be soon via WAP gateway. Until then you can use Belysio from your PC or laptop and gain the same integrated benefits.